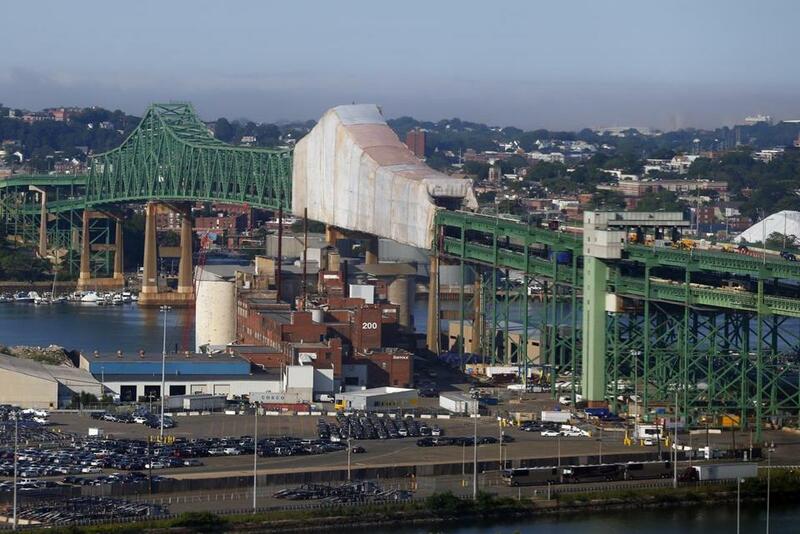 The first day of drive-through tolls on the Tobin Bridge. More poll respondents favored an increase in fees and taxes if the proceeds would go to repairs of local roadways. As supporters of a controversial gas tax ballot question gird for battle this fall, their success may depend on whether voters are convinced that new taxes would go toward road improvements in their own towns. According to a new Boston Globe poll, Massachusetts voters — particularly, conservative voters — are sensitive to whether their taxes will go toward infrastructure upgrades nearby. Half of the poll’s 625 respondents, all people likely to vote, were asked if they would support new fees or taxes if they knew the revenue would repair roads and bridges in their state. The other half were also asked if they would pay more to repair roads and bridges specifically in their own city or town. That slight difference in phrasing resulted in a stark contrast in responses. Support for taxes to fund statewide road improvements was split nearly evenly, with 49 percent in favor and 48 percent against. But support for increased taxes for local road and bridge projects outweighed disapproval by 20 percentage points — 57 percent in favor, compared with 37 percent opposed. The results could shed light on voters’ willingness to uphold legislation passed last year that pegs increases in the state gas tax — designated to pay for transportation projects — to inflation, an issue that will appear on the November ballot. And in a state where residents still cringe at the legacy of Big Dig overspending and corruption, the poll suggests that voters continue to worry that taxes and fees will end up funneled into boondoggle construction projects and faraway infrastructure improvements. That sensitivity toward the proximity of bridge and road repairs was much more dramatic for respondents who said they were likely to vote for Republican gubernatorial candidate Charlie Baker. Only 28 percent of those voters support increased transportation-related fees when it came to statewide roads, but 49 percent said they would support local road repairs. Seventy percent of respondents backing Martha Coakley, the Democratic candidate, supported road-related fees regardless of whether repairs were aimed at their immediate vicinity. Andrew C. Bagley, director of research and public affairs at the Massachusetts Taxpayers Foundation, said it’s natural for voters to care most about the roads and bridges they see every day — especially, he added, when they fear that they have become so outdated they are dangerous. Still, Justin Backal-Balik, manager of public policy and government affairs at the development group A Better City, cautioned that it’s hard to glean conclusions about how people will vote on the ballot question, which asks about maintaining a current tax policy rather than instituting a new one. The survey of 625 likely, registered voters was conducted by SocialSphere Inc. from July 13 to 15, and from July 20 to 22, using landline and cellphone numbers. The margin of error for the survey was 3.9 percentage points. 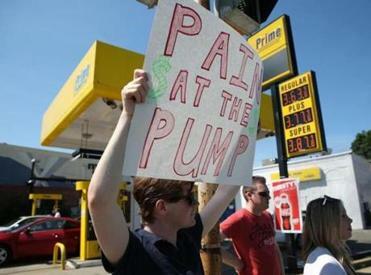 A protest last year over an increase in the state’s gas tax. The poll also offered some insight into residents’ confidence about the quality of drivers in the commonwealth: 31 percent said Massachusetts drivers are worse than their out-of-state counterparts, while 12 percent said they were better. Young people and men demonstrated the most confidence in the state’s driving abilities. The poll also provided an update on the gubernatorial race. For the first time since the Massachusetts Democratic Convention, Coakley had the support of less than half of all Democrats planning to vote in the party primary: She had the support of 46 percent of Democrats, compared with state Treasurer Steve Grossman, who garnered 18 percent, and Don Berwick, who captured 5 percent. Thirty percent of Democratic primary voters were unsure who they planned to support. Compared with Coakley supporters, respondents who said they planned to vote for Baker were much less likely to use public transportation and much more likely to have three or more cars. In a general election matchup, Coakley had a 5-point lead on Baker. And how’s this for Massachusetts political clichés: Compared with Coakley supporters, respondents who said they planned to vote for Baker were much less likely to use public transportation and much more likely to have three or more cars in their household. Only 7 percent of likely voters drive a hybrid vehicle, and almost none of them are Baker voters. Across the board, people who vote from either party are rarely dependent on public transportation. 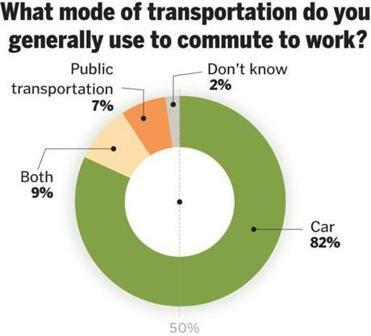 Eighty-two percent of respondents said they primarily drive to work in a car, while only 7 percent of respondents said they usually use buses or trains to get to work — though, among likely voters in the metro-Boston area, that number balloons to 34 percent. Across the state, 9 percent said they use both forms of transportation, with mixed commuting habits most prevalent around Boston, on the North Shore, and in the Merrimack Valley. Even among a significantly car-dependent crowd, some respondents conveyed aspirations of a switch to public transit: Though 18 percent of likely voters said they had no interest in public transportation, 19 percent said they would take public transportation more often if they could. For many residents, the lack of convenient transit options — because of infrequent trips, limited routes, inopportune routes, or unreliable service — are a deterrent to making the switch to using the T or opting for a local bus, Egan said. “Until we improve the public transportation system, we are missing an opportunity to attract new customers,” Egan said.